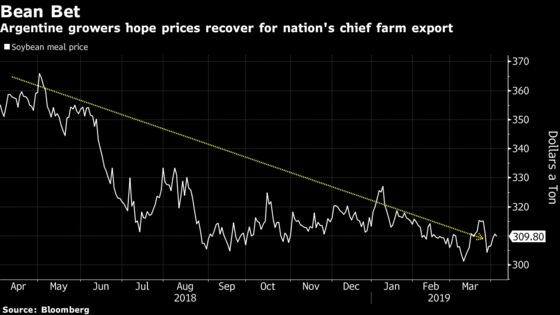 (Bloomberg) -- Soybean growers in Argentina are playing a waiting game, wagering on better prices ahead as the U.S. and China inch toward a trade deal and as nation’s currency keeps depreciating. Farmers on the Pampas arable belt have signed delayed-price contracts for almost three quarters of the 12.2 million metric tons they’ve sold to crushers and exporters so far, according to government data. That compares with 60 percent at the same stage last year. Delayed-price contracts work like this: Farmers harvest fields and truck beans to port. But they set a deadline of later in the year to fix a price and get paid. The harvest is just getting started, and many of the contracts were signed in advance of collection. Argentina is the world’s biggest exporter of soybean meal, made by crushing the oilseed. The trade could work out well for farmers who can gather enough cash from elsewhere to pay off debts taken on during planting. This year, many growers are selling corn -- forecast to be a record crop -- on the spot market to cover those debts. Meanwhile, they’re happy to wait for income from soybeans. That’s because they believe any breakthrough in the U.S.-China trade talks would see prices surge. Demand uncertainty following China’s move to snub U.S. crops has depressed global prices. On top of that, there’s the Argentine peso, the world’s worst-performing currency. The longer farmers can wait, the more likely they are to receive extra pesos for their dollar-denominated soy income. That’s a good hedge against sky-high inflation. The waiting game could be a self-fulfilling prophecy for the peso, defying expectations the currency will stabilize in April thanks to the arrival of crop-shipment dollars. That’s because exporters don’t have to sell dollars on the foreign exchange market until it’s time to pay farmers down the line. “It’s a way to speculate,” said Patricio Watson, a farmer in Cordoba province, comparing chances growers take on the delayed-price trade to a night at the casino. Growers also flock to the trade because it means they don’t need to pay for storage. Silo bags, for instance, cost hundreds of dollars. And there’s a risk beans in the plastic, sausage-shaped bags will get damaged by rains. For the crushers, including Bunge Ltd. and Cargill Inc., a supply of beans straight from fields gets cogs turning as soon as possible in plants running at just 50 percent capacity.